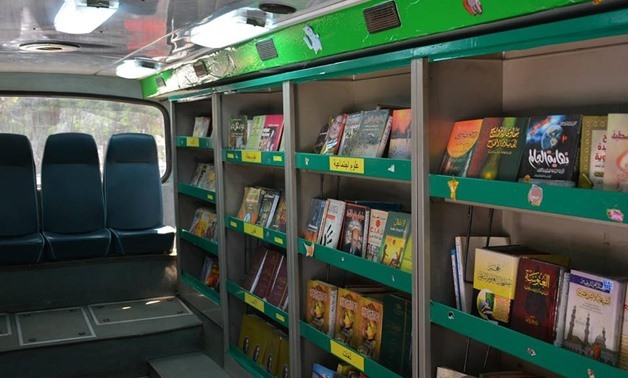 Minister of Culture Enas Abdel Dayem “launched and re-activated” the Mobile Libraries scheme at the start of the month, initially starting in the Al-Asmarat neighbourhood in Cairo’s Moqattam. Tomorrow (February 8) it will move to Mansheyat Nasser, returning to Al-Asmarat during the winter holidays. The Mobile Libraries project, which includes shows, art exhibitions, and workshops for handicrafts, drawing and colouring, is a joint venture between the National Library and Archives, the General Organisation of Cultural Palaces and the New Egypt Association. Further plans, reports Ahram, include moving the libraries across other neighbourhoods of Cairo, as well as spreading them to other parts of the Cairo Governorate. Image via the Egyptian Ministry of Culture. This image from the Ministry of Culture suggests the Mobile libraries project, while a step in the right direction, is not going to have readers fighting to get through the vehicle’s doors. Compare reports that the Cairo International Book Fair itself is breaking attendance records, with over 2.5 million people cramming in during the first half of the event. No question Egyptians are eager to read, given a good choice of books. Just maybe the Cairo Mobile Libraries project could learn something from what the Cairo book fair is doing.